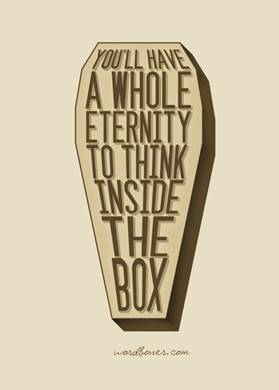 The term "Outside the Box" (or "Outside the Square") intuitively suggests a free from of thinking that breaks out of constraining boundaries, and has parallels with Lateral Thinking. 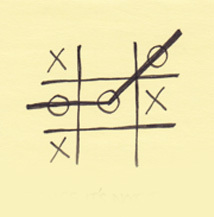 There is also a literal connection to thinking outside the box, as illustrated by the following example. 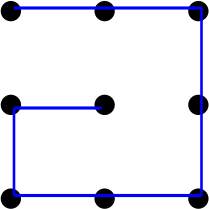 Before reading any further, think of ways in which you can connect all the dots with a series of connected straight lines, in Figure 1, below. In particular, what is the minimum number of lines you can use? 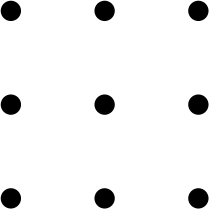 Of course, having opened up these possibilities, we can see that by taking things to extremes (eg expanding the dots so that they all overlap, or making the linewidth sufficient to encompass all the dots), then the problem can be "solved" with a single line. Here, of course, we see the importance of maintaining a connection between free thinking and testing ideas at an appropriate stage for their capacity to provide meaningful solutions to real problems. Of course, many will say "That's cheating", in the same way Alexander the Great was criticised for his solution to the Gordian knot - he cut it with his sword!